Two of the things I miss most from Ohio are fireflies and thunderstorms. I miss seeing the fireflies flashing out their seductive Morse code on a warm summer evening and I miss the ominous clouds, rushing wind, huge warm rain drops, flashing lightning and crashing thunder, and maybe most of all the smell right after a midsummer thunderstorm. So with these thoughts on my mind I decided to find out how a firefly produces light. I found some great cites and books to talk me through the process. Lets first look at the structures. 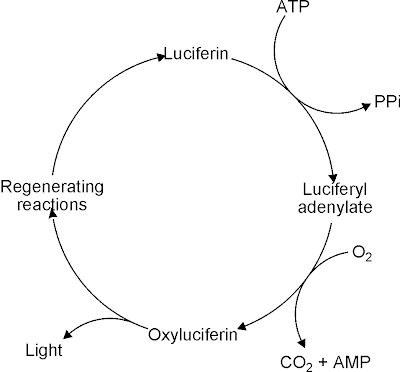 Shown below are firefly luciferin, luciferyl adenylate (luciferin attached to AMP), and oxyluciferin. The excited oxyluciferin* rapidly loses a photon of visible light as it goes to its electronic ground state. Ground state oxyluciferin is then regenerated into luciferin through a number of different steps. This is summerized in the figure below. For a more detailed explanation see Dr. Branchini's page on firefly bioluminescence, including information on the luciferase enzyme. I like the names of the chemicals. Do they show up in other animals, too? I always thought it was cool that they have two glands and they mix the two things together when they want light -- kind of like epoxy or one of those halloween glow sticks.